Features: Pressure relief valve installed turbo car envy fabulous voice? No way naturally aspirated distress relief valve is installed it? Then we also want to have this artifact, how to do? Application : Universal Applicable models: general without TURBO. 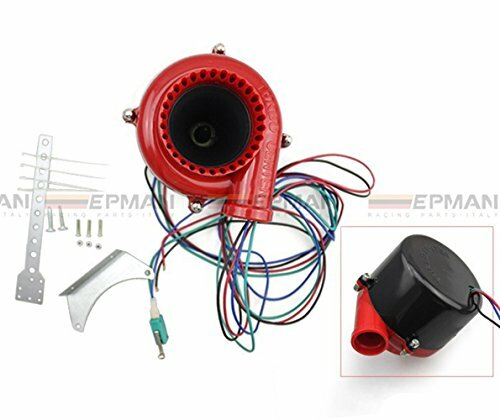 Package includes: 1 x Electronic turbo pressure relief valve Installation Instructions: 1) wired red wire to positive battery terminal 2) wired black wore to negative terminal 3) fed switch wires (blue and green) through fire wall to accelerator pedal. 4) Attached micro switch to accelerator pedal 5) connected switch to the normally closed terminal and earth terminal on micro switch 6) push accelerator fully in, when releasing the speaker makes dump valve sound. ** IMPORTANT INFORMATION ** Please double check the item size in our photo and description, if you bought the wrong size, we'll not responsible for the mistake, please kindly be noted, thanks. Minor modifications or adjustments maybe needed for some of our products. All items are Brand New unless stated otherwise on the listing. We sell DIY (Do It Yourself) Items with a few exceptions. Professional Installer Is Highly Recommend, No Installation Instruction Included. If you have any questions about this product by EPMAN, contact us by completing and submitting the form below. If you are looking for a specif part number, please include it with your message.